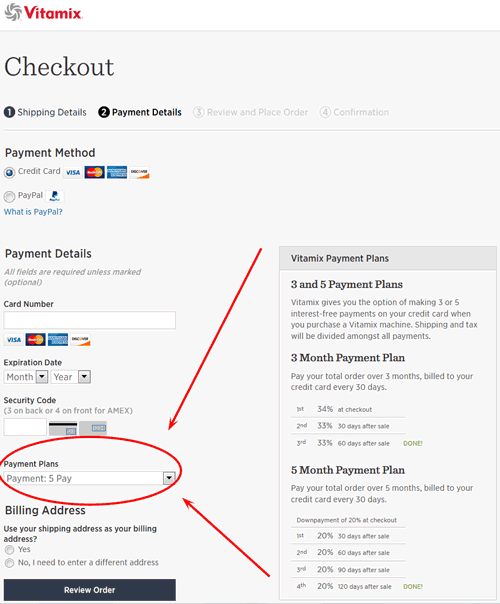 A payment plan can make it easier to get a Vitamix. Instead of waiting while saving up, you can start using it right away. Given that Vitamix machines have 5 to 10-year warranties, and will likely last much longer, it can make sense to spread out the purchase cost. Also, you get interest-free access to the money you would have spent on a single-payment purchase. If it’s something that you will use every day or even every week, the price of a Vitamix is worth it for many people. If you buy one and then realize that you’re not going to use it enough to justify the price, you can return it within the first 30 days for a full refund, including free return shipping. The terms of these payment plans are subject to change. The information on this page is meant to give you an overview of what I think are the important parts of the plans, but you should check the terms at the time of your purchase. The payment plans are different in the US and Canada. Check Vitamix.com for the full info. If you’re in Canada, the payment plans are a bit different. They offer a choice of 3 or 5 monthly payments with purchase of any machine. Your info has been most helpful. All I know is I want one for my new lifestyle of clean eating. Thank you! I read all your reviews and chose the Vitamix 7500. I cannot thank you enough. My life is about to change! I can’t thank you enough for this information! I have been looking to get a Vitamix for quite a while and after reading so much helpful information on your blog, I finally ordered one! The payment plan they offer is awesome and I used your promo code as well. 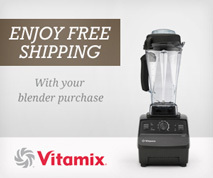 Can’t wait to receive my Vitamix! Thank you, Thank you!! It would have been months if ever before I actually purchased one of these due to my OCD to get the “biggest bang for my buck”, requiring me to do the type of research you have done here. I found this last night and I ordered today!! Thank you again for your efforts, they are greatly appreciated! !